What's the deal with liquor laws in Utah? Despite popular belief, Utah is not a dry state. Here are some facts about liquor in Park City and Utah. You can order an alcoholic beverage at most restaurants only if you order food as well. Bars are open every night and last call is usually around 12:30AM. Years ago all bars required a $5 membership fee, luckily that is not the case anymore! Utah bars are not allowed to free pour mixed drinks and drinks cannot exceed 1.5 ounces of alcohol. The beer sold at the stores and served in most restaurants only contains 3.2% alcohol. Full strength beers can be purchased at bars or the state liquor store. The only place to purchase bottled wine, liquor or full strength beer is the state liquor stores. There are three liquor stores in Park City and they are all closed on Sunday and major holidays. Weather can determine what transportation you need. If you are visiting during winter you need to be especially careful of the type of transportation you arrange for getting up to Park City as well as getting around. All too often we get calls from people who are stuck in a ride from one of the big car sharing services, you know the ones, and the drivers just are not prepared for snow conditions. Their cars often don’t even have snow tires. Not how you want to start your vacation. Always ask if the car has real snow tires, not just all-season ones. And, if snow is in the forecast, an all wheel drive or 4WD SUV is another great option. Don’t underestimate the value of a local driver. A good driver is a wealth of information on the area right down to which ski runs or hiking trails are best as well as who has the best Happy Hour or the tastiest tacos. If that sort of information sounds useful then be sure to book your transportation with a local Park City company using local drivers. Ones from the valley often use drivers unfamiliar with much more than how to get from the airport to your hotel. Have a group flying into SLC airport? 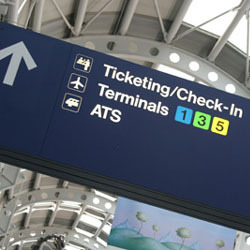 Not all transportation companies can provide direct curbside pick-up or drop-off for groups at SLC airport terminal. The use of larger vans and buses are restricted without special permits. If you have a group be sure to ask the transportation company about where they can pick you up and drop you off before you hire them. Can I wait to get transportation when I arrive at SLC airport? If you are the type who likes to “wing it” when you fly in somewhere and just hope for a ground transportation company to have open seats when you walk up…think again. Park City transportation, especially in winter, can get booked up well in advance. Sure, you can always use an app for one of the ride-sharing companies but think about it…if the regular transportation companies are booked up that means things are busy and companies like Uber are likely in Surge Pricing mode where you can pay a lot more than normal. Also, if you think you might be taking advantage of some of the numerous activities in the area it help to talk with a transportation company who can also help out with activities. Our company, Exclusive Excursions, handles both transportation to/from and around Park City but we also operate one of the top activity companies in town. One stop shopping is a great way to get the most of out your trip. Best place for casual atmospher yet great food? In winter - Fireside Dining at Empire Lodge in DV is one you can’t go wrong with. Giant fireplaces, multiple stations of great food to feast from, something for everyone, and… eat as much as you want. Reservations recommended and be sure to ask about the sleigh ride option. It is a nice 15 minute sleigh ride before dinner, leaves right from the dining area. Perfect! In summer – any of the outdoor decks along Main Street are bound to satisfy. Where is the best pizza in Park City? That's easy...and, I speak from personal experience on this…Maxwell’s has the best NY style pizza and Papa Murpheys has the best take-and-bake. Maxwells is a dine-in or take-out and has a bar and restaurant atmosphere. Papa Murpheys has a fully loaded one called Papa’s Favorite which is my all time favorite from anywhere. Papa M’s…no problem if you are staying in a rental or condo with an oven. Don’t miss $10 Tuesday…best deal in town. Both are out at Kimball Junction. I have a family with kids....SUV or Van service? Depends on how many kids. A family of four can be happy in an SUV. If there are six or more of you I would suggest leaning towards a van. Best thing to do is jump on the phone and discuss it with the transportation company. They have tons of experience getting people comfortably outfitted into the right vehicle. What is a good activity for a family with kids? Depending on the ages I recommend a tubing and Hot Springs cave adventure in winter and probably a combo of rafting and hiking or biking in the summer. They both create great memories and leave you tired but happy at the end of the day. I want to do something romantic but fun while in town. Suggestions? I always recommend a sleigh ride. Sleigh rides are cozy and fun and doing one with a fireside dinner at the other end is pretty much a guaranteed success. And, if you have kids …and want to share the sleigh…they can have a good time too while still creating the “magical moment” for the two of you. Summertime - Plan a hike or bike ride with an end spot where it is really pretty. Have a catering company meet you there with champagne...appetizers....dinner? Like that?...Give us a call and we can help out. #1 Tip is to avoid the markets from 3PM-8PM. That is when all the tourists do their shopping and the super markets can become a total zoo. Best to shop before noon (shelves are freshly stocked) or after 9PM. Also, Smith's has a new shopping service where you can shop online and they will have your order ready when you tell them to. You just pull up to a special spot in the parking lot, text them you are there, they bring it out to you and help you load it in your car. Awesome! Especially if you are flying in...have your order ready and when we pick you up at the airport we can stop on the way to your lodging and grab your groceries....very easy! Hey Mike,...any tips for getting around town? Absolutely avoid "rush hour" which is when the ski resorts let out, a festival winds down, or any event is causing street closures. Since this stuff happens year-round here, the smart people plan around these traffic jam causing situations. Not sure? Ask your driver about times you should avoid the streets, or at least allow extra travel time, during your stay.